Leaving my bags and jacket there, I wandered for sometime. I took a peek in to the smoking room only to found eight women and two men busy reducing their lifespan. Smiling I went ahead to the brightly lit restaurant zone. Everything seemed incredibly costly. A regular latte for 95 baht and a veg burger is about 90 baht. I didn’t have so much with me. “Lets exchange some”, my sleepy mind suggested. Bloody coffee addiction! I cursed myself and looked out for an exchange point. After a while and a cup of coffee, my friend asked me to join him for a snack at Burgerking. We found a person eating alone at a table while reading “never eat alone“. 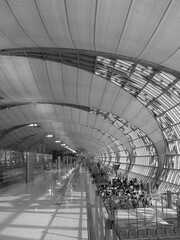 After a hearty laugh and some french fries we wandered for a really long time along the alleys of Suvarnabhumi Aiport in Bangkok.